Profile documentaries have a standard script: the essence of the protagonist’s life and contribution to the world is squeezed into minutes or hours. Cameras follow the protagonist going about their daily life and work. Their life today is interspersed with stories from the past. The script became standard because it worked—that is, until it met conceptual artist John Baldessari, and the smiling face of the standard script got lost beneath a huge dot. Henry Joost and Ariel Schulman, the provocative directors of controversial documentary Catfish, find in Baldessari a subject who is no stranger to controversy. Age 29 he cremated his life’s work, then sat in front of a video camera writing “I will not make any more boring art” on page after page after page until the video reel hit empty. A Brief History intersperses stories of Baldessari’s upbringing, success and artistic obsessions with objects of his daily life. If the stories are treated as sacred, untouchable hallowed ground, as celebrity life stories often are, then the everyday objects are a mundane and profane connection with the audience. These objects cast Baldessari as an ordinary person with a chair, a pencil, a messy desk and a coffee machine, just like most people. The tongue in cheek dialogue between Baldessari and narrator Tom Waits is sharper than Baldessari’s push pins. This wit, coupled with rapid cutting between shots and non linear storytelling, give this documentary a stature similiar to Baldessari’s. 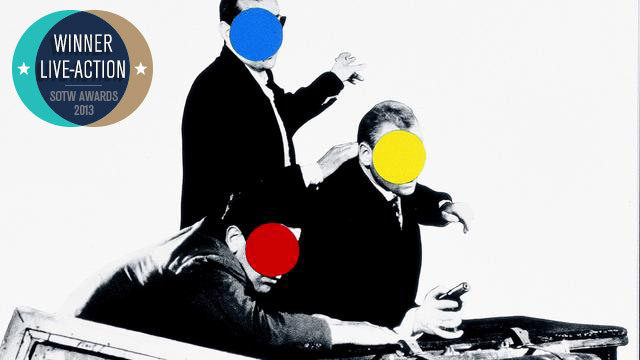 Baldessari is both a world-class artist and a six-foot-seven giant – he stands out from the crowd. Playful, provocative, down to earth and surreal, this film prods at the notion that art is solely for critics, academics, and other artists. Art, in Baldessari’s world, speaks to everyone.